Former Gov. Bob McDonnell must lose his state pension under legislation that he himself signed into law, Virginia Attorney General Mark Herring said in an opinion released Friday. The law's intent was always clear: Government officials convicted of a felony for misconduct in office would lose their state pensions. It passed after former Newport News Del. Phil Hamilton was indicted in 2011. But there was a potential catch in McDonnell's case: The law leaves it to the employer to determine that the misconduct occurred after the law passed, and to inform the Virginia Retirement System. Who, some wondered, employs a former governor? Gov. Terry McAuliffe asked Herring to weigh in, and Herring's office determined that it's the sitting governor, whom the Virginia General Assembly has previously identified as the "chief personnel officer of the Commonwealth." Now McAuliffe will inform McDonnell, grant him a hearing required by law and move to cancel his pension, spokesman Brian Coy said. The formal notice will come within a few days, Coy said. After that, the law "requires the forfeiture of all (state) benefits ... including spousal benefits and benefits accrued from service in multiple offices or positions," according to the opinion, which Herring signed. An attempt to reach McDonnell's spokesman late Friday afternoon for comment wasn't immediately successful. The law also allows him to appeal the issue to a circuit court judge. The former governor's pension would have been about $3,900 a month if he'd started drawing this year, and $5,400 a month if he retired at 65, and he may still recover some money. A footnote in the attorney general's opinion notes that McDonnell can seek a refund of his own contributions to the system, and the interest they generated. He can also seek full reinstatement if his conviction is overturned on appeal. The law kicks in before all possible appeals are exhausted, though. 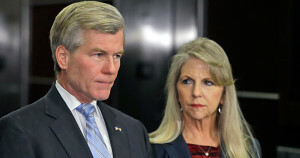 By legal definition, McDonnell was a convicted felon when his trial judge entered his conviction on 11 counts of corruption, the opinion states. That's also the trigger for the loss of voting and firearm rights, Herring noted. Some punishments contingent on a criminal conviction begin only, "after all rights of appeal have terminated," the opinion states, but that language isn't part of Virginia pension law. "We must presume that the difference in the choice of language was intentional," the opinion states. A 4th Circuit Court of Appeals panel has already rejected McDonnell's first appeal, and he has asked for a second. McDonnell maintains he broke no laws, and his case could ultimately go to the U.S. Supreme Court. McDonnell's wife, Maureen, was also convicted last year, and her initial appeal is pending before the 4thCircuit. Both were convicted of taking money and gifts from a wealthy Virginia businessman who wanted their help promoting a dietary supplement. When the Daily Press checked in January, no government entity had asked the retirement system to deny benefits to a convicted public employee since the legislation was enacted in 2011, according to spokeswoman Jeanne Chenault. The law didn't affect Hamilton's pension, Chenault said, because it didn't take effect until July 1, 2011 and Hamilton's actions predated it. The realization that Hamilton would still get his pension spurred legislators to pass this law. McDonnell signed it about two months before his family got a $15,000 check from businessman Jonnie R. Williams Sr. to cover catering costs at a daughter's wedding, and about a month before Williams treated Maureen McDonnell to a New York City shopping trip.